A commercial fishing boat in Alaska brings in a catch of sockeye salmon. Around the world, most major fisheries are facing severe over-fishing due to the tragedy of the commons. 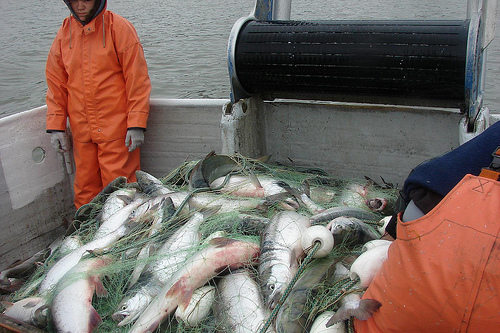 But some fisheries -- such as the Alaska salmon fishery -- are being managed sustainably today. Picture a pasture open to all. It is to be expected that each herdsman will try to keep as many cattle as possible on the commons. ... As a rational being, each herdsman seeks to maximize his gain. Explicitly or implicitly, more or less consciously, he asks, "What is the utility to me of adding one more animal to my herd?" This utility has one negative and one positive component. Adding together the component partial utilities, the rational herdsman concludes that the only sensible course for him to pursue is to add another animal to his herd. And another; and another. ... But this is the conclusion reached by each and every rational herdsman sharing a commons. Therein is the tragedy. Each man is locked into a system that compels him to increase his herd without limit -- in a world that is limited. Ruin is the destination toward which all men rush, each pursuing his own best interest in a society that believes in the freedom of the commons. Freedom in a commons brings ruin to all (Hardin 1968). Figure 1: The Tragedy of the Commons. Imagine we have a pasture shared by five herders, which can only accommodate four more sheep. 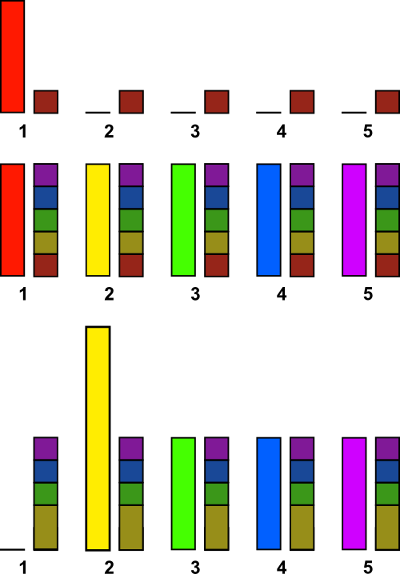 The top row shows how the situation looks to herder number 1. He gains all of the benefits (bright bar) from adding another sheep, but only one fifth of the costs (dull bar), since the costs are shared equally among all five herders. This looks like a pretty good deal, so he will take it -- as will each other herder. The result is shown in the middle row, where there are now five extra sheep in the pasture and thus its condition will be degraded. If herder 1 decides to be good and not add an additional sheep (out of concern that five extra sheep will damage the pasture), some other herder -- say, herder number 2 -- will see that the incentives shown in the first row still apply, and will add yet another sheep. Our "good" herder now still gets stuck with a full share of the costs, but without gaining any benefits, and there will still be too many sheep on the pasture. The scenario Hardin laid out has come to be known as the tragedy of the commons. In a tragedy of the commons, it's in each resource user's rational interest to use up the resource as fast as they can. Anyone who tries to practice conservation on their own is just a sucker, because the benefits of your good behavior will be snapped up by someone else. The profits of increasing your resource use are private, but the costs are shared by all users. Yet there's a big problem with Hardin's thesis, pointed out most forcefully by political scientist Elinor Ostrom. All around the world, geographers and anthropologists have documented instances of resources that have been used sustainably by people for centuries, without ever triggering a tragedy of the commons (Ostrom et al. 2002). So what's going on? The first issue to keep in mind is that the tragedy of the commons can only occur in what is called a common pool resource. A common pool resource is defined as one that is rivalrous but non-excludable. A resource that is rivalrous is one in which one person using it means that there's less left for someone else. Most of the things that come to mind when we think of resources are rivalrous -- coal, lumber, fish, etc. But things like a weather forecast or an invention are non-rivalrous -- if I look up the weather, that doesn't mean there's somehow less weather forecast left for you! A resource that is excludable is one in which it's easy to make sure only certain people can use the resource. The potential dilemma in a tragedy of the commons arises because it's difficult to stop people from being able to use the resource, but they will degrade it if they use too much. A resource may be privatized, meaning that it is cut up into pieces for each individual user. In Hardin's example of the pasture, the pasture could be fenced off into sections. Now each shepherd will bear the full brunt of their own decisions about how many sheep to graze. If you graze too many, it will degrade your own pasture, but nobody else will be affected. And if you decide to show foresight and limit the number of sheep you graze, nobody else will be able to steal the benefits of your better-growing grass. Unfortunately, many common pool resources are much more difficult to privatize than a pasture. Consider for example the deep ocean with its stocks of fish. It's impossible to fence off sections of the ocean for each fishing boat, preventing fish from swimming from one person's territory into another. Similarly, the air can be thought of as a common pool sink for pollution. It's impossible to fence off sections of air so that a factory's pollution falls solely on its own airspace. A second way of handling a common pool resource is to institute regulation by an outside power such as the government. The regulator can decree that each resource user can only use a certain amount of the resource, and then punish those who violate the rules. Regulation faces major hurdles in figuring out how much resource use to allow, and in enforcing that decision. Attempts have been made to combine the benefits of privatization and regulation through tradeable quota or cap-and-trade systems (Tietenberg 2002). These systems have been particularly popular with respect to air pollution and fishing. In such systems, the right to use the resource is allocated by permits. The total number of permits is set by a regulator who decides how much use the resource can withstand. Each permit entitles the holder to emit a certain amount of pollution, or to catch a certain amount of fish. The permit then becomes the private property of the holder, who can use it, sell it, or retire it as they see fit. The third option, which was ignored by Hardin but has proven to be extremely common around the world, is to manage the resource as a commons. The terminology here may be a bit confusing, since Hardin mistakenly chose the term "tragedy of the commons" to describe a management failure, but a commons is actually an effective management system. A commons occurs whenever the resource users themselves work together to keep their use within sustainable limits. For example, the fishing boat captains who harvest lobsters in New England agree among themselves what parts of the bay each captain can fish in, what types of gear they can use, and what times of the year they can fish (Acheson and Gardner 2005). Ostrom identified several principles that make a commons likely to succeed (Ostrom 1990): 1) the resource must have clearly defined boundaries, 2) there must be rules for using the resource that fit local conditions, 3) all users must be able to participate in decision-making, 4) there must be effective monitoring of users to catch violators, 5) there must be sanctions for violators that can be increased for increasingly severe misdeeds, 6) there must be cheap means of conflict resolution, and 7) the user group's legitimacy must be recognized by higher-level authorities. Effective commons management has been applied to a variety of resources, from alpine pastures to coastal fisheries to irrigation canal networks. Not every resource can be easily managed as a commons, however. Many modern regional or global scale environmental problems, such as ocean overfishing and greenhouse gas emissions, are too large to easily translate the management systems that work at more local scales. The final option is for the resource to remain open access. An open access resource is one that has no limits on how it may be used. When Hardin wrote about the tragedy of the commons, he really should have been writing about the tragedy of open access. An open access resource will be conserved only by chance, or by the inability of users to exploit it as fully as possible (e.g. due to limited technology) (Krech 1999). Classically, environmental policy in the US and similar countries was conducted using an approach called command-and-control. Under a command-and-control system, the government issues regulations, and citizens and companies are required to comply under threat of fines or jail time. But recent decades have seen a shift toward greater public participation. Just as the name suggests, public participation refers to environmental management systems that allow those affected by the decision to have more direct input into it (Dietz and Stern 2008). The people affected by some decision are referred to as stakeholders, because they have a stake in the outcome. If we imagine the example of a decision about whether to breach a dam in order to allow salmon to swim upstream, for example, the list of stakeholders would include people living near the river, utility companies, sport fishers, environmental groups, and native tribes with treaty rights to fish, among others. Public participation arose as a response to complaints and agitation from stakeholders that environmental regulations were inflexible, ignored local interests, and imposed unreasonable burdens. Proponents of public participation argue that it has three main advantages over command-and-control regulation (Fiorino 1989). First, public participation increases compliance with the ultimate decision. When people feel that their input has been seriously considered, they are more likely to see the result as legitimate, and to go along with it -- even if they did not get their way. Second, public participation leads to more technically competent decisions. The people affected by a decision, such as local residents and resource users, often have important information (from their personal experience or from TEK) that can contribute to the decision. They may know how the river flow tends to vary over the seasons, or where additional toxins were illegally dumped. Finally, public participation is widely held to be morally right. In a democratic society, morality seems to demand that we seek greater input from the people rather than letting scientific or political elites make decisions. Various mechanisms have been used to promote public participation. Surveys, focus groups, public hearings, planning workshops, the formation of citizen advisory panels, referenda, written comment periods, and a variety of other mechanisms have been tried. No one mechanism is a magic bullet, because much depends on the attitude of decision-makers and how well they implement it (Chess and Purcell 1999). A public hearing may be a real opportunity for decision-makers to listen to public concerns and get feedback that shapes the final plan. Or it may be meant just to let angry citizens blow off steam and to allow the decision-maker to say that they complied with a legal mandate to let the public participate. Sherry Arnstein suggests that we can think of participation opportunities as falling on a sort of ladder, running from least to most participatory, as shown in Figure 1 (Arnstein 1969). At the low end are attempts by decision makers to manipulate or co-opt other stakeholders. In the middle are situations in which stakeholders' input is taken into account but the final decision still rests with the traditional decision-maker (e.g. the EPA). At the top of the ladder are situations in which stakeholders' preferences are binding -- everyone has to abide by what the stakeholders agree on. Despite the virtues listed above, not everyone thinks public participation is so great. We can summarize the main criticisms of public participation as the technical critique, the environmentalist critique, and the radical critique. According to the technical critique, public participation is inefficient and costly (Pini et al. 2007). Indeed, holding even relatively pro forma hearings can cost substantial amounts of money, and delay progress on making the decision about how to manage the environment. This might be worth it if the public's input was useful, but according to proponents of the technical critique this is not the case. They argue that the public is poorly educated, particularly on the scientific topics that are frequently critical to environmental management, and subject to irrational fears (Breyer 1993). If environmental policy is altered based on ignorant and irrational input, the end product is worse for the environment and for people. The environmentalist critique asks what interest groups are given more power by public participation (Coggins 1999). If the decision to be made is one about what kind of logging to allow in a National Forest, for example, the definition of "stakeholder" for that forest is likely to mostly cover people living in or near the forest, who will be largely part of or sympathetic to the logging industry. Yet shouldn't a National Forest be managed for the good of the whole nation? Furthermore, opening up the management decision to local input seems to be a way to get around environmental laws and the rights of environmental groups to sue in court to get those laws enforced in the strictest manner possible. If conservation is morally and legally right, then why should local stakeholders get to overrule that based on their personal interests? The radical critique is suspicious that the government could ever truly incorporate public input (Cooke and Kothari 2001). Public participation exercises, proponents of the radical critique argue, just serve to co-opt people into endorsing the government's ideas. Any input that would truly challenge the status quo is banned, for example by rules about what narrow range of topics are allowed to be brought up at a public hearing, and by demands that statements be backed up by quantifiable evidence and stated in a detached, emotionless manner. According to the radical critique, public participation is just an effort by the government to get citizens to do its job for it. Acheson, James M., and Roy J. Gardner. 2005. Spatial strategies and territoriality in the Maine lobster industry. Rationality and Society 17 (3): 309-341. Arnstein, Sherry R. 1969. 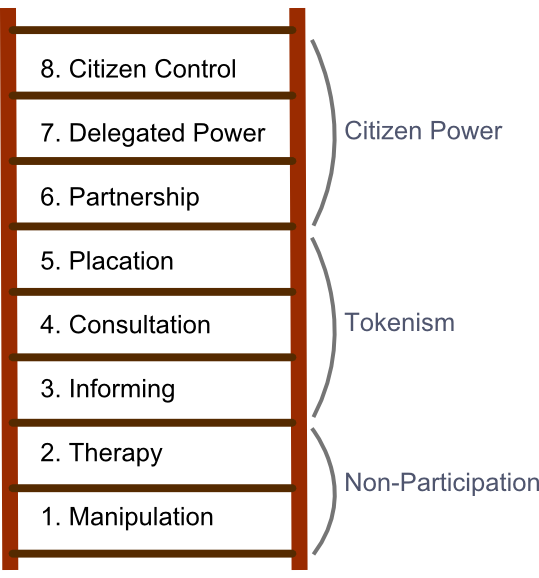 A ladder of citizen participation. Journal of the American Institute of Planning 35 (4): 216-224. Breyer, Stephen. 1993. Breaking the Vicious Circle: Toward Effective Risk Regulation. Cambridge, MA: Harvard University Press. Chess, Caron, and Kristen Purcell. 1999. Public participation and the environment: Do we know what works? Environmental Science and Technology 33 (16): 2685-2692. Coggins, George C. 1999. Regulating federal natural resources: a summary case against devolved collaboration. Ecology Law Quarterly 25: 602. Cooke, Bill, and Uma Kothari. 2001. Participation: The New Tyranny? London: Zed Books. Dietz, Thomas, and Paul C. Stern. 2008. Public Participation in Environmental Assessment and Decision Making. Washington DC: National Academies Press. Fiorino, Daniel J. 1989. Technical and democratic values in risk analysis. Risk Analysis 9 (3): 293-299. Hardin, Garrett. 1968. The tragedy of the commons. Science 162 (3859): 1243-1248. Ostrom, Elinor, Thomas Dietz, Nives Dolsak, Paul C. Stern, Susan Sonich, and Elke U. Weber. 2002. The Drama of the Commons. Washington DC: National Academies Press. Pini, Barbara, Su Wild River, and Fiona Haslam McKenzie. 2007. Factors inhibiting local government engagement in environmental sustainability: case studies from rural Australia. Australian Geographer 38 (2): 161-175. Tietenberg, Tom. 2002. The tradable permits approach to protecting the commons: what have we learned? In The Drama of the Commons, ed. National Research Council, 197-232. Washington DC: National Academies Press.